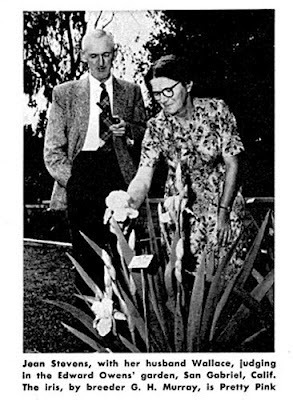 The Hybridizer, Grace Sturtevant, Wellesley Hills, Massachusetts (1865-1947) began Iris breeding in 1910 and flowered her first seedlings in 1912. 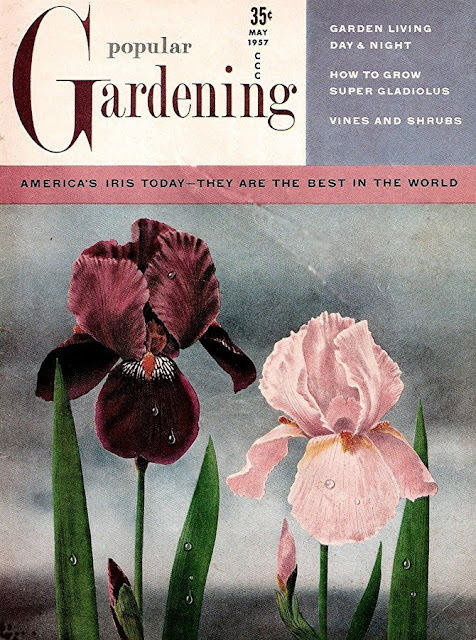 Her gardens were named 'The Glen Road Iris Gardens' and her first catalogue was published in 1917. Miss Sturtevant used European named varieties in making her first crosses and the names Oriflame, Caterina, Dalmatica, Iris King, Dr. Bernice, Aurea, Queen of May,and Mme. Chereau appear in her early breeding records. To quote from her early catalogue notes, "For me there is no ideal type. We want varieties of varying height for garden colour. We desire also varieties which possess qualities of form, carriage, or colour developed to perfection and at least some of us like samples of the curious and unusual". These comments still have relevance in today's iris world. Grace Sturtevant was both a founding member and Life member of the American Iris Society. SINDJKHA, G. Sturtevant, 1918 TB 36" M S3M Color effect a blended lilac-drab, neutral violet bicolor. S. Hay's lilac suffused pale brownish drab shading to avellaneous and bronzing at the base, reticulated purplish brown; F. Chinese violet shading to reddish brown at base, veined neutral red and reticulated brown on yellow outer haft.Style branches dull yellow and beard conspicuous orange. Growth moderately vigorous, the foliage stiff and broad and the flower stalks erect, stout, exceptionally tall, and well branched. The blooms are large open and of firm texture. In effect, this sort resembles a dull 'Caterina'. Rating 83. Sindjkhat; Standards lavender bronze,shaded to dark olive bluff at the base. Falls light purple, shaded and pencilled with soft brown at haft. Late 4ft. 5 shillings. SINDJKHA TB-S3M. Sturtevant 1918; Sturtevant 1918; Sheets 1928; Class VI a (1) ; AAA 142; Sindjkhat ; ☐ ; 83; 81; 80. Explanation: Class VI a (1) Blend -Varieties with standards of shot shades, pale blue or lavender, the yellow being scarcely perceptible. I know of no commercial grower in New Zealand that sells this outstanding Iris at present but there was a grower in South Auckland who had this Iris Catalogued and Mis-labeled as 'Opal Light'. It was also grown and labelled as 'Opal Light' in the official 'Jean Stevens Collection', but that's another great story of intrigue and pious hand-ringing so much so it will have its own post at a latter date. American visitors wanting to purchase this variety could try 'Argyle Acres'. 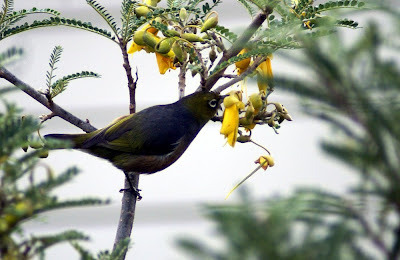 Photo taken in the gardens of Dawn Callaghan in Martinborough, Wairarapa, New Zealand. Irises and Archives is a extremely well written blog by Gareth Winter a well respected Garden writer and plantsman who lives in nearby Masterton. Gareth is also the editor of the 'Almanac' the bulletin of the Society for Pacific Coast Native Iris. The slideshow of Californian Irises on his blog are just magnificent. Give it a look you will not be disappointed. Had a chat today with Julie May of 'The Iris Garden' fame who informs me that Starwoman is growing in her well manicured Canterbury gardens. So anyone who drops in for a cup of tea at her very famous tearooms should be able to see the iris in full bloom this coming season. The Iris Garden also has 'MING' the Sass Medal Winner 2008 in the display gardens, so stop by early spring and check them out. 'STARWOMAN' wins the Dykes Medal!!!! STARWOMAN is such a stand out Intermediate Iris and so deserving of this award and it's the first time for an Intermediate Bearded Iris to win. DYKES MEDAL WINNER 2008 STARWOMAN (Marky Smith 1998). Previously winner of the Hans and Jacob Sass Medal 2005, AIS Award of Merit (AM) 2003, AIS Honorable Mention (HM) 2001. 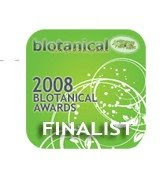 The AIS at their annual convention in Portland, Oregon in 2006 also honoured Marky by presenting her with an AIS Hybridizer’s Medal. STARWOMAN Marky Smith, Reg. 1997, Sdlg. 90-26E. IB, 25" (64 cm), M; Standards blackish royal purple (blacker than RHS 86A), faint lavender grey marks at deep purple midrib; style arms strong mauve violet, edges greyer; Falls pearl (lighter than 156D) ground, ½" darkest black violet (darker than 86A) rim and center stripe, dark violet dashing and stitching within rim; beards blue violet at end, gold-tipped blue violet central area, yellow in throat; ruffled; slight sweet fragrance. Chubby Cheeks X Keppel 83-8A: (Snowbrook x sib). Aitken's Salmon Creek 1998. HM 2001, AM 2003, Sass Medal 2005, Dykes 2008. 'Starwoman' is available from Kingswood Irises 15 Railway Road Woodlands R D 1 Invercargill. 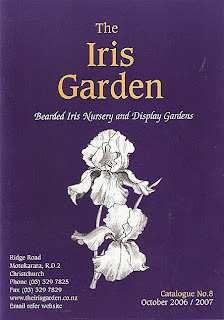 Write to Marion Rutherford for their Catalogue which is on CD with some of the best Iris photos around. This iris nursery I highly recommend!!!! For our American visitors Starwoman can be purchased from Mid America, Aitken's Salmon Creek Garden, Schreiner's Iris Gardens. Visitors from England could try Claire Austin Hardy Plants. Links to these growers appear in the 'IRIS LINKS' on the left hand side. Its a great way to celebrate my 50th post for the blog. Another Jean Stevens Iris I have in my collection which is a top performer. Good branching, increase, and high health.The gold/yellow standards are clear and bright and the flaring red brown falls has a fine gold margin and highlighted by a brilliant gold beard this iris can brighten even the darkest corner of a garden. Brilliant Sunrise is the Pod parent of 'Alison Penney' another stand out variegata introduced by Jean Collins (NZ) in 1979. I have no doubt that when this iris has increased enough I will have no trouble in finding new homes to have it flowering in. . This obviously is the best way for the survivability of all her cultivars. To grow a collection of any Irises of historic value in just one place is not good risk management it could only be considered just plain stupidity!! We have at last a brilliant clear coloured variegata, broad petaled and smooth hafted, combining colour, height and size, to take the place of the smaller flowered old favorite Staten Island. Broad standards of a rich clear gold and falls of an even, deep brownish red make a clump of this variety stand out vividly in any collection. A strong grower and excellent branching. Easily the finest variegata we have ever seen. 3½ ft. BRILLIANT SUNRISE (J. Stevens, R. 1963). Sdlg. 1/f89. TB 42" M. Y4R. Standards clear gold; Falls red-brown; margined gold. From long line of variegatas and yellow amoenas., Wanganui Iris 1965. I have a great affinity for this Iris as it was my first major find of the Jean Stevens Yellow Amoena Line and is a stunningly bright, stand out Iris. I marvel at the tips of the style arms colouring. This iris in anyone's garden is pure theatre and I am glad that this iris grows well for me at home. Foliage shows good PBF. Center Photo Another fantastic photo from Sarah Cook which she took recently in Merian Park, Botanical Garden, Brüglingen, Switzerland. 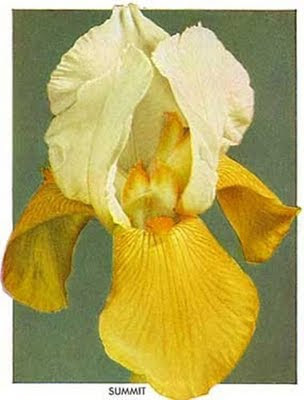 From the 1954 Schreiner's Iris Catalog: "Mrs. Stevens has produced three yellow amoena's or near amoena's: Pinnacle (light yellow and white), Summit (deep yellow and white) and Mystic Melody (deep yellow and cream). Of the three, Summit is the most contrasting by far and an Iris of seemingly epochal importance to the Iris breeder. A very tall Iris with superb branching, its moderate sized blooms have standards which are absolutely snow white and falls of a deep golden yellow creating a wonderfully refreshing and breath-taking contrast." Hi folks, Just a heads up. Eddie Johns has just started a blog NZATA@OTARABIRCH so for all you Gardener's that are starting to ponder on how to start sowing that Japanese or Siberian Iris seed that you have put away in the cupboard, now would be a good time to pay the blog a visit. Otara Birch Gardens grow New Zealand's Premier Collection of Japanese Irises and there would be no better collection of these fine irises anywhere else in the country. Don't forget to Bookmark the page, and leave some words of encouragement!!!! Recently doing research on Historic New Zealand Irises, the following from 'The New Zealand Gardener', Letter's from Readers, October 1949, caught my eye. LOUISIANA IRISESI Have been reading that Australian iris fans are becoming enthusiastic about a new race of irises known as the Louisiana's. I have some irises in my garden,claimed to be Louisiana's which I obtained some 12 years ago. Do you know if they were offered in New Zealand at that time, or are they wrongly named?- "Curious,"Lower Hutt. [ It is quite true that the Australians have suddenly become enthusiastic about the irises from Louisiana. Some fifteen species were introduced to New Zealand by the editor of this Journal in 1932, who received seed from the late J.K. Small,one of the plant explorer's who discovered them. They were offered for sale for a year or two by one iris specialist, but for some reason were later dropped.The writer finds they flower profusely with him in October, the aspect being semi-shade,the soil moist and acid] Editor 1949 J.W.Matthews.The second part of the puzzle is the 1934 entry in Jean Burgess (Stevens) Stud Book which is copied below. 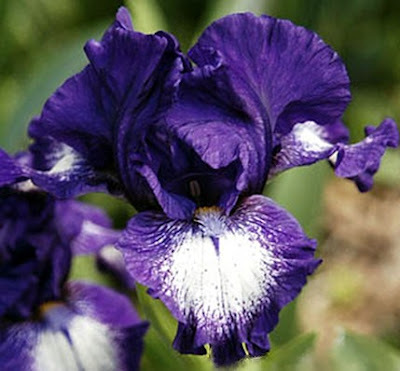 I am not a great fan of Louisiana Iris and as there was no further mention of the LA blooming in later notes of Jean's, I never paid the entries too much attention . 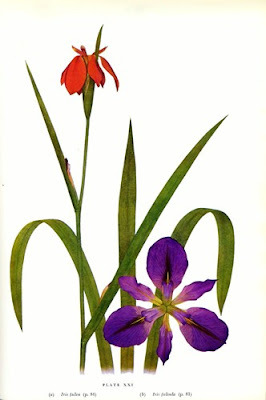 I do not consider that the two separate subject matters are inter-related because of the importation of seed from the same supplier, and I can not find any confirmation that A. H.Burgess and Son was the Iris specialist referred to in the above, but what it does show is seed from the same source, J.K. Small, was sent to New Zealand, reportedly grown and plant progeny from these lines were sold in the 1930's. This book is one of my best Iris reads which is clearly, simply but concisely written in the style of a non-fiction novel. An example of the many great books written a while ago by specialists well known in their day which include much that remains engrossing, helpful as well as being of historical interest. Harry Randall spent the whole of his business career in the electrical supply industry and became the first Chairman of the London Electricity Board. He was more widely known however through his lifelong interest in horticulture. In turn he specialized in roses, fruit, daffodils irises and hemerocallis. Irises were his greatest passion and before his death in May 1967 he had established a world wide reputation as one of the greatest cultivators of irises in modern times. To study the genus further, he paid many visits to the United States, bringing back a selection of the best American varieties which he used in his hybridizing.By sharing pollen and plants with British enthusiasts he earned their gratitude,since their own efforts had been curtailed by the War. 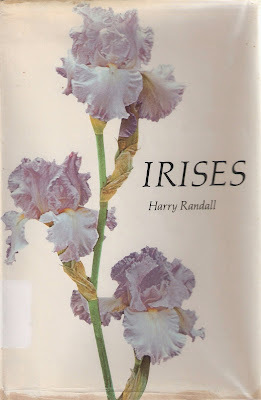 He was President of the British Iris Society for several years and served on many committees of the Royal Horticultural Society, judging at their Shows and at their trial grounds at Wisley and the Chelsea Flower Show. Among the numerous awards made to him were the Distinguished Service Medal of the American Iris Society,and the Foster Memorial Plaque. A Great Quote from the Introduction. Many of the Books are devoid of humour and they were mainly for readers who years ago, could secure all the gardening help they required. Most of us now have to think of saving labour; we wish to have the maximum of interest and beauty for the minimum of effort; we have to consider the mundane question of expense; and wish to derive pleasure from our gardening. I assured him that they did, but that fun moved in a mysterious way its wonders to perform. The majority of the gardeners who come to see my irises never worry about cytological theories; but I find that their appreciation of good flowers and their love of beauty is as great as that of any connoisseur. 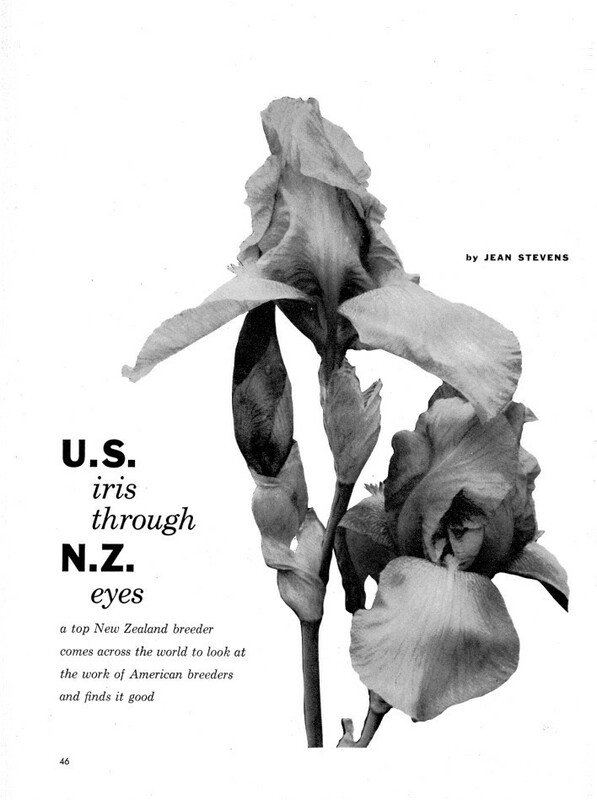 U.S. iris through N.Z. eyes. A top New Zealand breeder comes across the world to look at the work of American breeders and finds it good. You who know them are familiar with the pleasure an iris flower gives you when you look at the balance of its flowing lines. Surely no flower eclipses or improves on the sheer artistry of its form. But then add to beauty of line color ranging from brilliant to delicate, strong to pastel to pure, endow this paragon with ease of culture, and you have a flower that is bound to have a thunderous following. There is still another trait which adds to its charm, and that is the fact that the veriest amateur can succeed in developing newer, lovelier varieties. With iris the process is not complicated. I began raising iris in New Zealand 30 years ago when the finest in the world came from English and French breeders. Their products started my breeding lines. My first success was Destiny, a bronze-toned, purple-black that was different and better enough to gain honors in England. It still is grown in English, American, and New Zealand gardens. Then, in the late '30s, I produced a giant called Inspiration, also popular today. 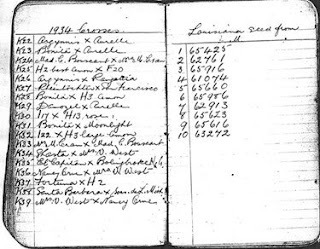 By this time Americans had overtaken English and French breeders, so instead of sending my new seedlings to England for evaluation and comparison with the world's best, I sent them to America. That is how it came about that Pinnacle, the first variety with snowy white standards and primrose yellow falls, made its debut in an Oregon garden. Last year, when I had the great pleasure of spending a whole iris season in the U.S., I found it not only fascinating but wonderfully helpful to observe how my New Zealand seedlings compared with those of American breeders. During the last 10 years Americans (and do not forget there are more amateurs working at hybridizing than professionals) have favored pinks, blues, whites, and frilled and flared forms. I know because these colors and forms were what I saw as I journeyed around American iris gardens. Plicatas were featured in a few of the gardens I saw but not to the extent they were a dozen years ago. Yellows, so valuable in an iris planting, no longer were among the first favorites though there were notable exceptions. Creams seemed to have gained ground. And here and there and everywhere the most patient breeders were trying for the elusive amoena. The modern amoena in which white standards are contrasted against soft yellows, pale orchid-pinks, pastel blues, are more appealing than the harsher white and violet, white and purple of the past. I could not help but think that if amoenas were as easy to develop as pinks or blues, there would be more breeders working with them. As I have concentrated most of my efforts on amoenas during the past 20 years, I was extremely interested to learn how many breeders would like raising the new pastel-falled amoenas if they were not so difficult. Up to now, a breeder succeeded in creating them only by line breeding. He had to be very patient, had to raise tens of thousands of seedlings before he got one that would stand up when compared with the new iris of other colors. I said earlier that I found it fascinating and most helpful to see how a U.S. breeder's seedling patch compared with mine. My patch is notable for the thousands of flowers with white or cream standards, whatever the fall color may be, whatever the quality of the flower may be. Some of the iris in my patch are ruffled, few are really frilled, most have flared or semi-flared forms. As you look around you cannot help but notice I make something of a fetish of good branching. Line breeding, the more certain method, is favored by numerous American breeders. Doubtless this is why there are the best breeders. Nevertheless, if I may criticize the work of the average American, I would say he has neglected branching for color and form. Rarely do you see a striking new American iris with perfect branching. Often branching is the bare minimum that will get by. There are, of course, notable exceptions to this generalization as there are to most. The lovely new red Trim, and the finest white I saw. Wedding Bouquet, have perfect branching. I, however, want to make my point: good branching is really a must in a garden flower winner. By introducing the blood of Iris reichenbachi (a dwarf bearded species from eastern Europe) into his iris, Paul Cook has bred amoenas of many color combinations which are not recessive at all.I saw some wonderful new amoenas in his garden, new in every sense, for they were bred neither from orthodox white and purple, nor from the neo-orthodox white and pastel, but from a foreign iris. They are unrelated to those recessives which tax the breeder's patience.His development of easily bred amoenas is the most romantic, sensational, momentous happening in iris breeding in many years and amoenas, as we know them, are only part of the story. Another characteristic abstracted from reichenbachi has already showed up: hybrid white iris with colored borders around their crystal-pure falls. The possibilities inherent in reichenbachi blood are far from fully explored. But what has been achieved to date is critically important and will have great influence on iris breeding. Every breeder who sees a new break dreams of what he could get by mating this with that and, true to character, I dreamt as I walked in Paul Cook's garden, of what I might get if I could add this wonderful new blood to my own unrelated amoenas. I have been struggling many years for a variety with pure white standards and soft pink falls set off by a tangerine beard. Though I have succeeded in getting the colors, I have yet to succeed in getting the right size and form. These qualities I must bring into my white and pink iris from other varieties. When I do, I will lose the white standards for two generations or more. So, every time I improve my whites and pinks I set myself back. How much easier it will be when I can use Paul Cook's amoenas which are not recessive but will hold their white standards for me in the very first generation. Reprinted from Popular Gardening magazine, May 1957. I saw this magazine on E Bay a couple of years ago, and after a vigorous bidding war that I won, the magazine arrived New Zealand, and to my surprise found the article was written by Jean Stevens.